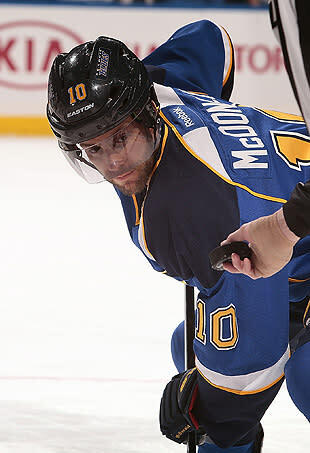 From Dec. 2010 to Feb. 2012, St. Louis Blues center Andy McDonald missed 74 games due to two concussions. On Thursday, McDonald’s health concerns finally trumped his NHL career. As first reported by Andy Strickland of TrueHockey.com, McDonald, 35, has decided to retire from the NHL after 11 seasons due to post-concussion concerns. “The last few years too much of the focus became worrying about the next hit. I was always thinking about it.” Said McDonald. Retirement began creeping into McDonald’s head during the regular season but it wasn’t until after the Blues were eliminated by the Los Angeles Kings did he become 100% sure. He spent the last several weeks with his family and is confident now is the right time to move on with his life. McDonald played seven seasons with the Mighty Ducks of Anaheim (and then the Anaheim Ducks) before being traded to the Blues in a package for Doug Weight in Dec. 2007. He won a Cup with the Ducks in 2007. His time with the Blues was marred by injuries, including multiple concussions. He was set to become an unrestricted free agent after fulfilling a 4-year, $18.8-million contract. Returning to the Blues was “foggy at best,” according to Strickland. It’s been a while since we had a player call it quits due to concussion symptoms. McDonald’s former teammate Paul Kariya was one of the more high-profile examples back in 2011, when he retired from the NHL and called out its disciplinary system for being too inconsistent on head shots. Now, McDonald joins the list of players who have cited concussions as the reason their careers have ended. You know who probably feels like garbage today? Cal Clutterbuck, who was heard screaming “I hope you get another concussion” to McDonald from the Minnesota Wild bench last season. Welp, he won't; he's had enough, Cal.